At Niagara Peninsula Orthodontics, we are proud to offer top-quality orthodontic treatments and services, including Invisalign, to patients throughout the Ontario area. Our goal is to create healthy and beautiful smiles for the whole family, and we do this by providing comprehensive care for patients of all ages. We want to give you a smile that you are proud to show off for years to come! Practicing good oral hygiene at home is a very important part of this. Our Ontario patients know how important it is to brush and floss properly when wearing braces— but what's the best way to do so? First, make sure you’re using the right toothbrush. Either a soft-bristle brush or a bi-level brush (one that has shorter bristles in the middle and longer bristles at the edges) can be effective. Used carefully, an electric toothbrush can work just as well, but be sure the electric brush is set to a moderate power level, and don't let its vibrations cause the back of the brush to hit the braces! Brush using a fluoride toothpaste at least two times per day (preferably after meals), for at least two minutes each time. Beginning with the outside surfaces, place the tips of the bristles flat against your teeth, and use small circular motions to gently polish them clean. Be especially careful to clean the areas between wires and teeth, where food particles can easily become trapped. For areas between brackets and gums, tilt the brush toward the gum line (down for the bottom teeth, up for the top) while keeping up the circular motions. Next, move on to the chewing surfaces of upper and lower teeth, using a firm back-and-forth motion. Finally, finish up by carefully brushing the inside surfaces of the teeth the same way you did the outside surfaces. If you're having trouble cleaning the areas near brackets and wires, there are some special tools that may help. 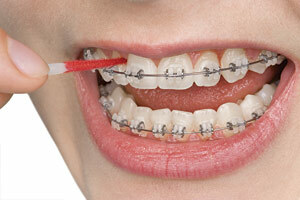 The interdental toothbrush, or proxabrush, has a small tuft of bristles that stick up all around, like a pipe cleaner. Use it gently and carefully to clean the tiny spaces under wires and around bands and brackets. Another special cleaning tool is the oral irrigator or “water pick.” This device shoots a small stream of pressurized water at your teeth, which can help dislodge bits of food that become trapped in nooks and crannies. While it's easy to use, an oral irrigator isn't a substitute for a toothbrush or dental floss. But when used along with proper brushing and flossing techniques, it can be very effective. First, pull one end of the floss through the threader, and then push the threader— carrying with it the free end of the floss— under the archwire. Grasp the floss on each end and slide it up and down the sides of both teeth, and all the way under the gums until you hear a squeaky sound. Finally, pull it out and use a new section of floss for the next area. Ever wonder how effective your tooth-cleaning techniques really are? There's an accurate way to tell, using special vegetable dyes called “disclosing solutions” or “disclosing tablets.” As they dissolve in the mouth, these dyes highlight plaque and food debris that brushing has missed. You can then easily remove the dyed spots— and you'll know for sure if your oral hygiene methods need a little “brushing up.” Your Ontario orthodontist can provide this service to help you know what areas need a little more care at home. Contact Your Ontario Orthodontic Treatment Center! We at Niagara Peninsula Orthodontics strive to educate all of our Ontario patients on the importance of maintaining their new smiles at home. Keeping your teeth and gums healthy now is an investment in your future, enabling you to get the best results from your orthodontic treatment. Dr. Pershad and his dedicated staff are happy to discuss any questions or concerns you have related to oral hygiene or any of the services we provide, so we encourage you to contact us, or fill out our appointment request form to schedule a visit. We can’t wait to hear from you!